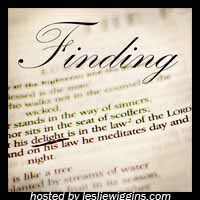 My friend Leslie is hosting this year a wonderful challenge: Finding Delight in God's Word. I read about it and loved her idea. This year in which I want to continue on the things I have attained and at the same time, be purposely watchful I must not forget that Finding Delight in God's Word is what will help me persevere. If my heart is somewhere else, if it is not delighting in God's Word, how can I continue in the way I should go? How can I be truly watchful if I don't find my utmost delight in God's Word, the Lamp to my feet? The first verses are a wonderful encouragement to abide in the Word, to read it and contemplate it. The more I read the Word of God, the more I incline my ear to it, the more I delight in it. And of course I must memorize it; if I don't do so, how am I going to keep it within my heart? Verse 23, "Keep your heart with all vigilance, for from it flow the springs of life." is a verse we have read and heard, but really, read it slowly, once again. What am I doing to keep my heart with all vigilance? As a mom, it seems that I am more willing to "keep my children's heart with all vigilance" than to do something practically about my own heart. I know (or I presume to know) that I know what my children should do to keep their hearts. But what am I doing to keep my heart with all vigilance? This goes perfectly with what I am aiming for this year: Be watchful, Becky. * Watching my words, all that I say. * Watch where am I fixing my eyes; where I am focusing. It is so easy to stop looking at the goal. While doing school with my children and grading, while cooking and baking, while enjoy a cup of coffee, a good book, a great conversation, I must remember at all times that it is that in Him that I move and live and have my being. It is for Him that I do all things. * I must ponder the path of my feet. Take time to consider if I am walking in the way I should go. Am I building my relationships or tearing them apart? Am I mortifying those sins that I still pamper? Am I walking straight or maybe I am just starting little by little to swerve to the right or left? I delight in God's Word because it is there where I see how much I need Him and how much I hunger for Him.